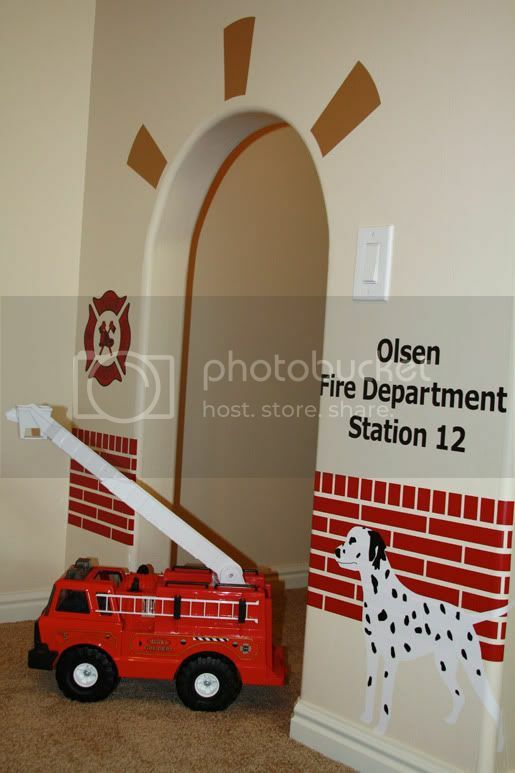 One of my good friends Brandy's mom contacted me about an under the stair space she wanted decorated for her grandkids. And, what would be more perfect than a Firestation!? It was really fun for me, because she let me do whatever I wanted!!! So, this is the design I came up with. It was so much fun and made me want to do more fun stair spaces, so if anyone has one I can practice on, PLEASE call me! The nice thing about this design, is it should fit most spaces, wether you have a square entrance, a different size arch, or even a door. You can make this work with any space. You can customize anything you need about this package so it will work for you space perfectly. You can can get more bricks, you can get the crest, the dalmatian, and the station title different sizes. Just let me know. I thought of the dalmatian last minute and he is my FAVORITE part! He is just so cute! I love how he turned out. Normally you wouldn't be able to see white very well against a wall that was so light, but you can see him great when you put him in front of the bricks. 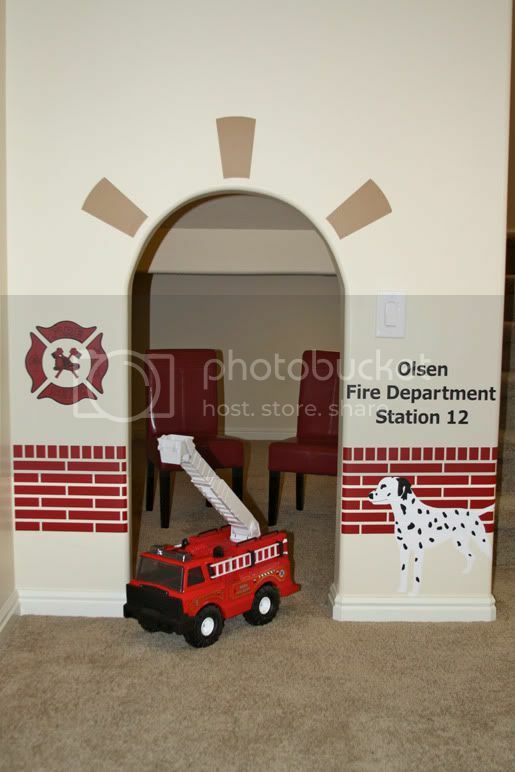 You could also put him inside the firehouse if you wanted more decor in there as well. Also, you can order him mirrored so he'd be facing the right if you wanted to. 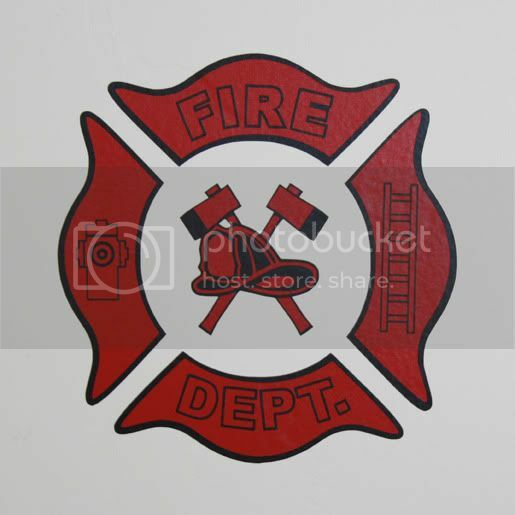 The Firefighter Crest was so much fun to create! I thought it was going to be really hard to assemble, considering you had to put the red color on top of the black and line it up perfectly, but my worker bee, Kelsey, did an amazing job! I thought it would be cute to do some title plaques inside the space. 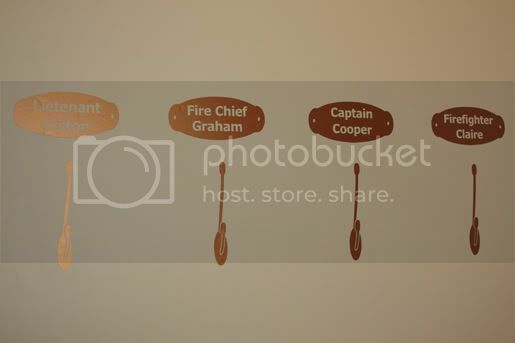 So, we printed them custom with the children's names and a hook underneath to (pretend) hang up all your firemen gear. 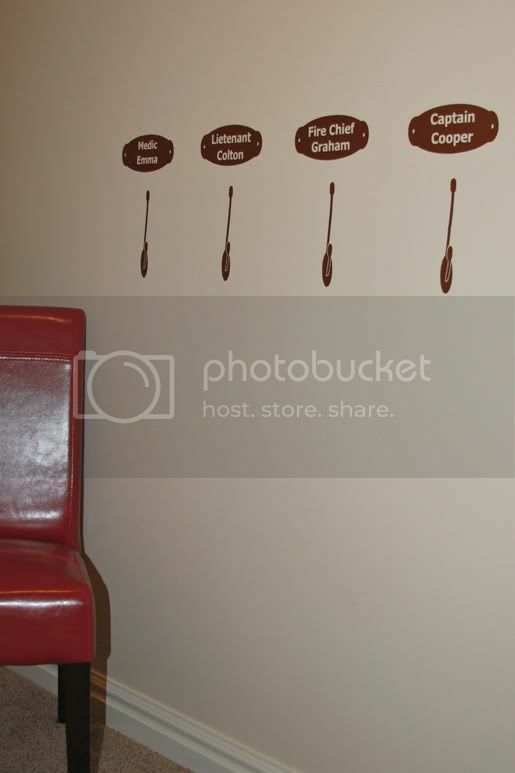 You could hang real hooks if you had some cute dress-ups to hang on the hooks and forget about the vinyl ones. - One sheet of bricks at W38"xH9.5". 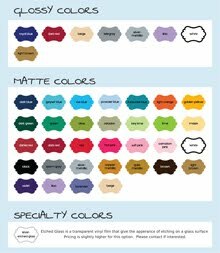 All you need to do is cut the vinyl to your desired size to fit your space. 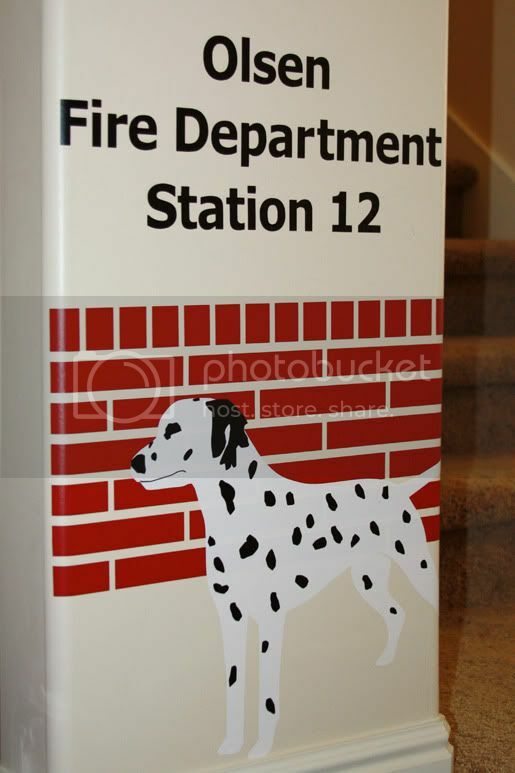 - 3 Corner Stones at W4"xH6.5"
- Custom Station Info at W16"xH6.7"
- One two color, already assembled, Dalmatian at W15.7"xH13.3"
- One two color, already assembled, Firefighter Crest at W9"xH9"
- Up to 7 custom title plaque and hooks at W4.7"xH8"
My package is available at my Etsy store.